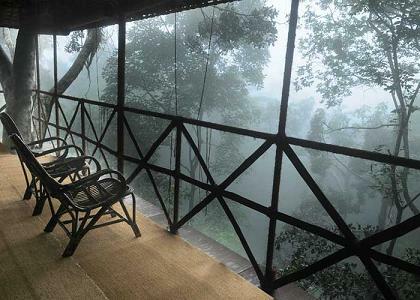 Spread across either bank of a sprightly mountain stream that runs through the 150 acre property, the Vythiri Resort is a delightful jungle hideaway and a naturalist's treasure trove. 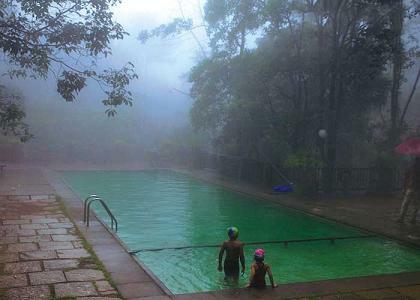 Wrapped in the cool embrace of a rainforest, stone lined pathways, canopied by majestic trees, lead to brick coloured cottages built in the style native to the region. Built of brick with wooden rafters on the roof, furnished in cane, wood and fabrics of discreet elegance, the cottages are equipped with all modern amenities. 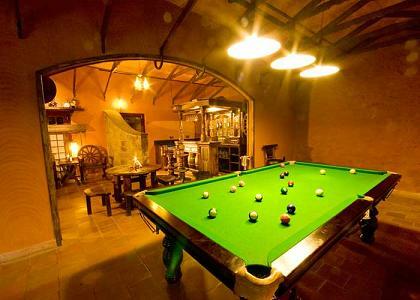 The accommodations are designed so as to provide residents an immediate experience of the surrounding sights and sounds. 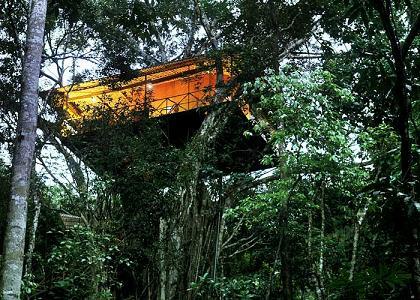 Available in configurations ranging from heady tree houses, to cottages on stilts overlooking the stream and further downstream, cottages with jacuzzis, private pools and a suite, everywhere, the muted hiss of the stream is a continuous serenade. 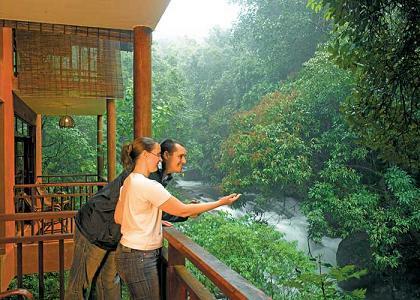 A rope bridge across the stream, leads to the restaurant overlooking the swimming pool at one end and a sweeping view of the forest all around. 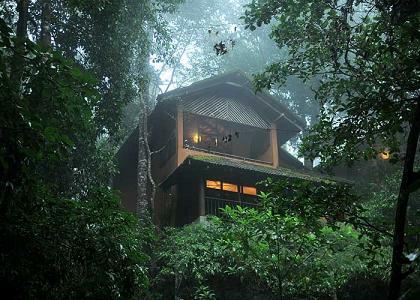 The Vythiri Resort has the finest Ayurveda Centre with a team of dedicated doctors and experienced men and women therapists. The centre provides various therapies, under the guidance of an expert Vaidya (Ayurveda doctor). At Vythiri Resort, therapies are prescribed only after a qualified Ayurveda physician has made a detailed examination of the person and his health history. Well-trained and qualified technicians administer the therapies under the supervision of the physicians. Some of the rejuvenation and therapeutic programmes which are provided in the Ayurveda Centre are Rasayana Chikitsa, Kayakalpa Chikitsa, Body Sudation, Body Slimming, Herbal Steam Bath, Beauty Care, Panchakarma treatment, Dhara, Sirodhara, Pizhichil, Najvarakizhi, Elakizhi, Shirovasthi, Kativasthi, Snehapanam, Udwarthanam and Tharpanam and yoga and meditation. The Vythiri Spa menu includes a wide array of classic and new treatments massages, scrubs, wraps, facials, various baths, foot and hand care, toning and firming. We also have fitness programs, fruit and vegetable juices and of course an extensive range of spa products for sale in our spa boutiques. Our treatments are specially developed to suit the purpose of relaxation for body and mind while on vacation. We have combined the best traditions of Ayurveda with Aroma Therapy and modern massage techniques to create a unique experience. 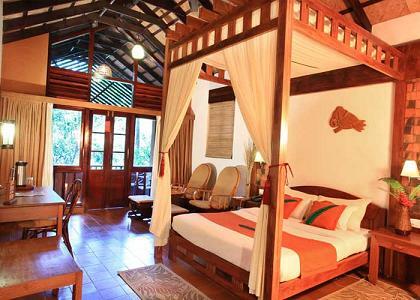 The accommodation at the Vythiri Resort consists of Planter's Lodges, Cottages and Tribal Huts with well appointed and tastefully furnished 6 rooms. 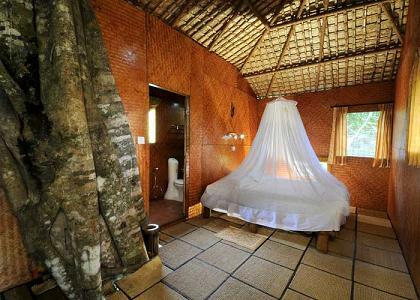 The cottages and huts are built in the traditional ethnic style and takes you back to an indigenous tribal village. 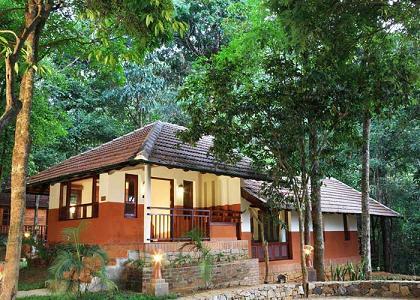 The rooms are fully furnished and have a verandah that offers a beautiful view of the lush surroundings and flowing stream. There are 18 spacious river-facing cottages which offers the golden opportunity of waking up to the sounds of a gurgling stream. These cottages are ideal for couples and family. The floorings are of terracotta tiles and red-oxide finished with red polished floors. 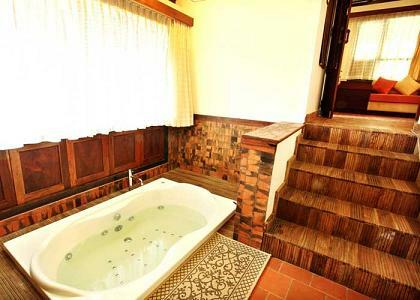 It has all modern amenities including en-suite bathroom, hot water etc. The tile-roofed Planter's Lodges are inspired by ancient Kerala traditions. 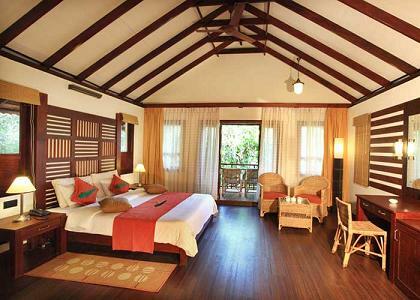 Besides these cottages, there are 12 individually thatched tribal huts, ideal for the adventure lovers. 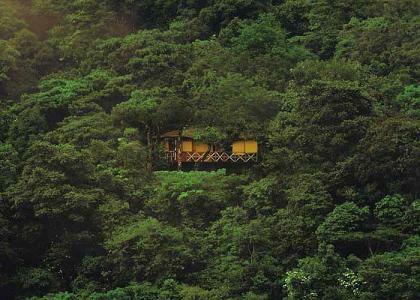 The tribal huts are built completely from mud, bamboo and thatched leaves. 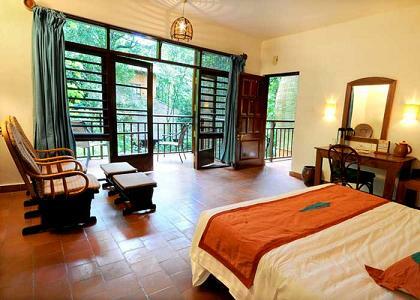 Some of the facilities which are available at the Vythiri Resort includes the Ayurveda treatment room with shower, Steam Room, Plunge Pool, Spa Boutique, Ayurveda Centre, Restaurant, Swimming pool, Conference hall, Health Club, Doctor on call, Travel Assistance and Safe Deposit Lockers. 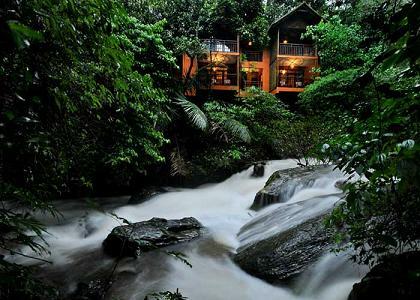 The Vythiri Resort is located in the Wayanad District in North Kerala, about 60 kms from Calicut.